Our product range includes a wide range of Leave Management such as Leave Policy Payroll Software, Multiple Leave Schemes Payroll Software, Leave Transactions Payroll Software, Year End Processing Payroll Software, Employee Self Service (ESS) Payroll Software and Leave Management Software. 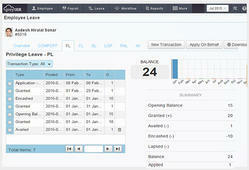 This software helps to track all the leave transaction of the employees and leave balances automatically. This service is render by our highly professionals who always ensure that our service delivered in a timely manner. Apart from that, this service is extensively demanded because of its trouble free functionality, accuracy and on time delivery. As we are well known service provider in the market, we are involved in offering the reliable Multiple Leave Schemes Payroll Software service. In this software one can create multiple leave schemes for various employee categories in terms of entitlement, quantum of leaves and other policies. 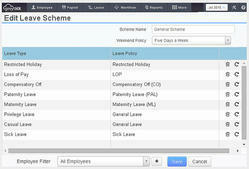 Through this software all the leave request of employees are automatically routed to their manager for the approval. This service is providing at cost effective prices. Streamlining employee leave management gives you a golden opportunity to tackle multiple concerns in a single stroke. 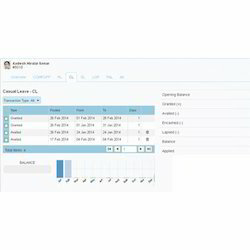 It eliminates busy work involved in leave administration and employee follow ups, saving time and transaction costs. When your company’s leave policy is enforced consistently, it improves transparency & employee satisfaction. 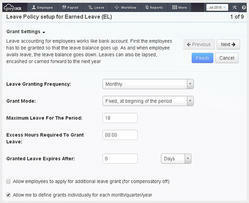 The greytHR leave management software automates everything from leave accounting, grants, to period closing activities. Additionally, should you find yourself lacking a leave policy, we have a library of standard policies that you could choose from. The leave policies of your organization are tailored to your specific needs. Our leave policy setup is highly configurable and flexible to fully implement your policy, whatever it is. Looking for Leave Management ?